In the coming weeks, there will no longer be two associations representing calypsonians when it comes to negotiating with the Spicemas Corporation (SMC). 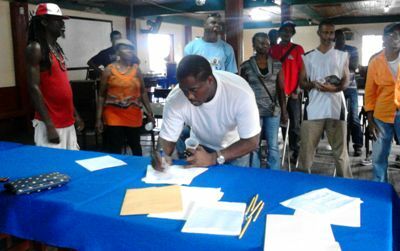 As of last week Saturday, more than thirty calypsonians decided to form one body and relinquished their membership in the Grenada Professional Association of Calypsonians and Tents (GPACT) and the Grenada Calypso and Cultural Association. Interim president of the steering committee which is organising the formation of the one body, Elwin “Wizard” McQuilkin, believes that the coming together of all in the artform will work in the membership’s best interest. “We recognise the need for one body and that is what we are aiming towards now. It will be in our best interest as calypsonians to work collectively for the common good,” said Wizard who was an executive member of GPACT. In 2001 the then Grenada Progressive Calypso Association spilt, because some members violated an executive and membership decision not to participate in carnival events. “We know that there were a driving force behind this and others saw it as an opportunity to rise, but I hope that this new body will work towards gaining the respect that when a decision is made, members will be not be enticed from behind and not stand up with the executive,” said Raymond Matthew,who is known in the calypso world as Beast. The new body is as yet unnamed, but the idea in moving forward is for all those who have signed the resolution to terminate their membership with the Grenada Calypso and Cultural Association and GPACT, to meet and elect an executive body. McQuilkin has already indicated that though he played a role in spearheading the formation of this new body, he doesnot wish to be part of the executive. “I don’t want my political beliefs to become an obstacle in any way. We know how people think, always linking things to politics. If we are negotiating and things reach a stalemate, you know that people will say that is because of my political support towards the National Democratic Congress,” he said.